N.B. The bats in the photos are the actual bats for sale. AVAILABLE WEIGHTS: 2lb 7oz, 2lb 9oz & 2lb 10oz. Made from Grade 1+ (Pro Grade) English Willow. Entirely Sapwood - no CP Original bats will have any heartwood. Virat Kohli Profile, with Duck Bill Toe - helps create a very light pick-up. Full Profile with no concaving - ensures a very wide sweet spot. Mid Middle - ideal for all round stroke play. Finest 12 Piece Cane Handle (medium thickness). Full Length CP Padded Bat Cover included for no extra cost. The CP Original Cricket Bat is made from English Willow that's good enough for the professionals (Grade 1+). The profile shape is also preferred by many professional players, including Virat Kohlil, with a duck bill toe, full profile and mid middle. Boasting thick, 35mm+ edges and a thick toe, the CP Original Cricket Bat is ideal for aggressive stroke play all around the ground. 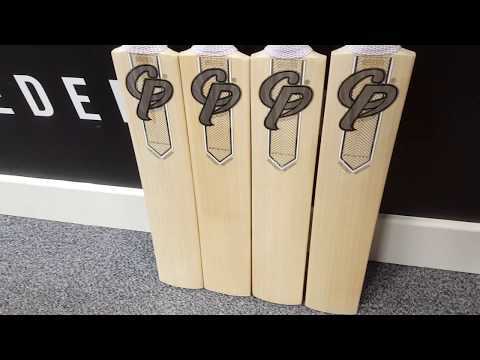 The CP Original Cricket Bats will have 10+ grains, and are all entirely sapwood, so stunning looks are guaranteed! In addition, a free CP Full Length Padded Bat Cover is included, to protect your investment!